Every winter and spring, Youth Speaks Seattle hosts 3 preliminary slams, one Wildcard slam, leading up to the culminating finale Grand Slam in April. 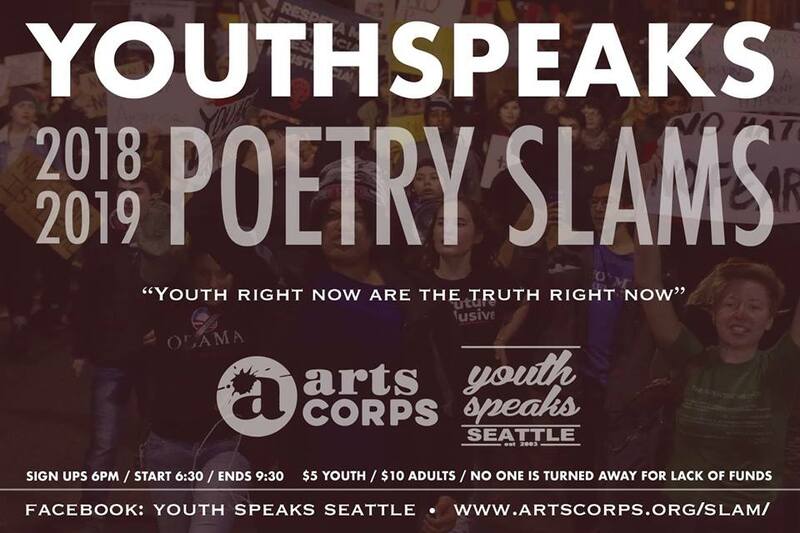 The top 3 finalists of each prelim slam win a place to compete at Grand Slam for the opportunity to represent the Youth Speaks Seattle team at esteemed international youth poetry competition, Brave New Voices. Slam provides an energetic stage, mic, and audience to witness and celebrate young people’s voices in a world where they are often silenced. – MUST be between the ages of 13-19. If you are 20 by July 2019, you, unfortunately, cannot compete. -Bring 3 ORIGINAL poems to perform, one for each round you potentially compete in. – Each poem must be under 3 minutes and 30 seconds. – Use of props, costumes, or musical accompaniment is prohibited. – Come 30 minutes EARLY to sign up. The 12 spots go fast! We chant this at every slam. We believe scores do not have the power to define us or our experiences. We recognize that scores can have an impact on participating poets but they are not the reason we come together. We use the slam format as a tool to gather community and ignite a space of artistry, truth and social change. Contact slam@artscorps.org for questions or concerns!